I can't believe it has been a year since I started this blog. Its crazy to think about. I was so nervous to start one...would people really care or be interested in what I have to say?! So thank you to everyone who reads this and supports me on this journey of doing what I love as a career. What's a birthday without presents?! (I guess aging...and I'm not really into that!) So this this week I will giving away some of my favorite things. I realize I'm not Oprah and going to send brands into another level of success, yet I hope you enjoy these things as much as I do. Check back each day for a new treat. So for today's totally awesome, can't live without treat: Diptyque Baies Candle...I really can't live without these...especially this time of year. Its my all time favorite scent and I haven't met many people that don't love it too. Leave a comment below telling me: What is your favorite candle for fall?! For one additional entry Like Confetti & Stripes on Facebook and then leave a comment letting me know...must be a separate comment to have your name entered twice! One winner of a 6.5 oz Diptqyue Baies Candle will be announced next Tuesday, October 22 via my instagram. Would you believe I've never smelled a baies candle before?!?! I like you on Facebook! My favorite candle is a mistletoe candle from GDC in Charleston I got last year. I have no clue who makes it and I was so sad when it was over! i love linen scented candles! Love this scent! Right now I'm burning a linen scent in my bedroom and a fir in the living room. And I fb commented! Happy, happy birthday, c+s! Happy Happy Birthday Confetti and Stripes! My favorite fall candle candle is the nest pumpkin chai candle. I don't have a favorite scent. I'm always trying something new. I don't have a specific favorite but I do love spicy pumpkin/vanilla type candles in the fall. CONGRATS on your 1 yr anniv! and happy blog birthday! my favorite fall candle scent is anything cinnamon/brown sugar/vanilla inspired. I don't yet have a fave scent - but I've never tried Baies! I have a feeling it would be my instant favorite. Thanks so much for the giveaway! I recently discovered your blog and love it. What fun! You are so kind to do this giveaway. I generally like vanilla scents for fall, although right now I am using red currant by Votivo, which is great. I like C&S on facebook! My favorite fall candle is the Voluspa Santiago Huckleberry, the jar is so gorgeous too! I Like Confetti & Stripes on Facebook now! Hazelnut or pumpkin spice for Fall! 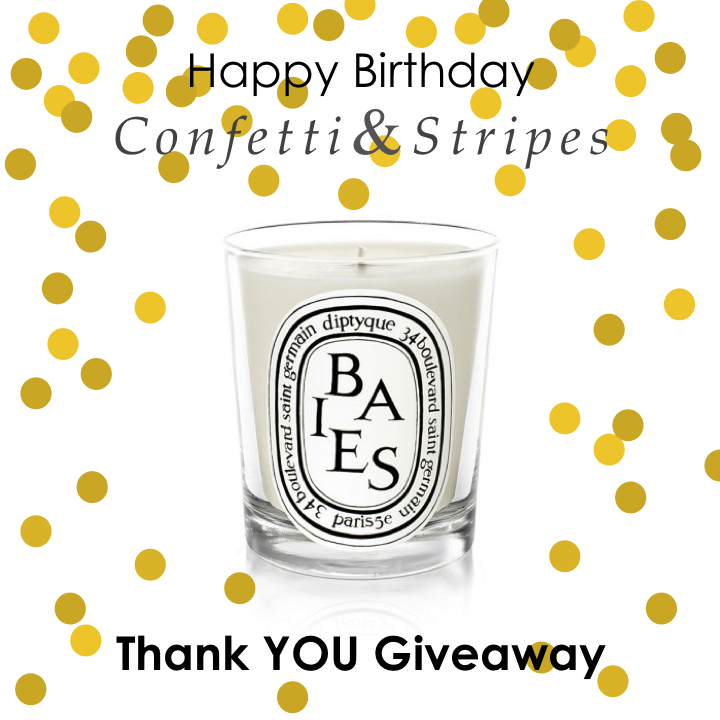 Liked Confetti & Stripes on FB! I don't have one! I never use candles but was thinking of adding one to my house so I have been on the hunt for a new scent. Would love to win. Baies is my favorite too! I feel like I should branch out and try something new but I never do. I've heard another Diptyque scent is great for fall/winter but I can't remember what it's called. My current Baies candle is about to burn out, so fingers crossed I might get this one! Congrats on blogging for a year! I feel like I've sputtered out after almost four and I don't blog nearly as much as I used to or I should. Just liked you on FB too! Hope to run into you again soon! Like Jessica Christophillis, I am also into all of the rewined scents as well! Ok, not to sound TOO unoriginal but in all honesty THIS (picture you've shown) is my all-time favorite candle!! I love them so much! So much, in fact, I've added it to my 'wish list' for a birthday I have quickly approaching :) Speaking of, a very happy birthday to you and your blog! That's so exciting! I started following you in IG and love your stylish posts and design thoughts! I started a blog this past year, and boy did I underestimate the work put into a great one I aspire to eventually become! (sigh). thanks for the inspirations and motivations! Congrats, Mallory, wishing you many more! My favorite fall candle...probably anything with a hint of cinnamon, or warm spices! I'm a sucker for pumpkin scents. I LOVE fir and evergreen scents, though. anything with cinnamon and apple! my favorite scent is anything sugary! i.e. baked sugar cookies, cupcake, candy corn, cotton candy! i also liked your facebook! I'm loving pumpkin spice for this time of year! I love anything pumpkin :) go figure! but it just screams fall!